My arrival procedure was to fly into Bangkok and take a bus from there to the Poi Pet border of Thailand and Cambodia. This was quite an adventure. By myself, with a huge duffel bag and a large backpack and an idealistic attitude. Once I crossed the border, I was to be picked up by the local coordinator and driven to my final destination is Battambang. I had to wander around the bus station for quite a while before I was able to get my bearings and find the window I wanted. I get a ticket for the border and wait a while till the bus is ready to leave. I am finding the heat much warmer here than in Hong Kong. Thankfully, the bus was air conditioned. Sure it smells like fish, but that is a trade-off I am willing to make. While sitting on the bus waiting for departure, I was reading my book, Vagabonding by Rolf Potts. A white man and his wife/girlfriend (backpackers by the looks of them) walk by and he says how the book is very good and he has a copy in his bag. It is always nice to show some camaraderie on the road. It seems like he is living the vision expressed in the book. After the six and a half hour bus ride (only supposed to take 4 hours), we get off at near the border. As soon as you step out, you are swarmed by locals offering things. I make my way past them and grab my bags, only to realize that I have no idea which way to go and there are no signs around. I spot some westerners from my bus walking confidently away, so I take a chance and start to follow them. My gamble paid off, as they were heading to the border as well. I catch up and talk to them as we go and find out they have already acquired visas too, so we skip the super long lines to head to Thai exit immigration. There is only one line, so I let them go first since they were nice enough to show me the path. We part ways here and exchange words of good luck. Now this is the first time I have ever crossed a border on land (other than driving to Canada, but that hardly counts), and I always assumed that it was basically just a line in the sand with officers checking passports and such on either side. At this border, that is not the case at all. There is like a no man’s land in between the border offices that is filled with casinos and all sorts of other stuff. I was quite baffled by this. As I walk out of the office, I get swarmed again, but this one man is really persistent. I start explaining to him that I’m getting picked up and don’t need a ride, when he says, “wait are you an American from Chicago?” Taken aback, I say yes, and he says he knows the guy who is supposed to pick me up. Now I am skeptical of this, but he takes me across the street to a man who asks the same thing and when I say yes, he goes, “Oh you must be Tim Hanlon! 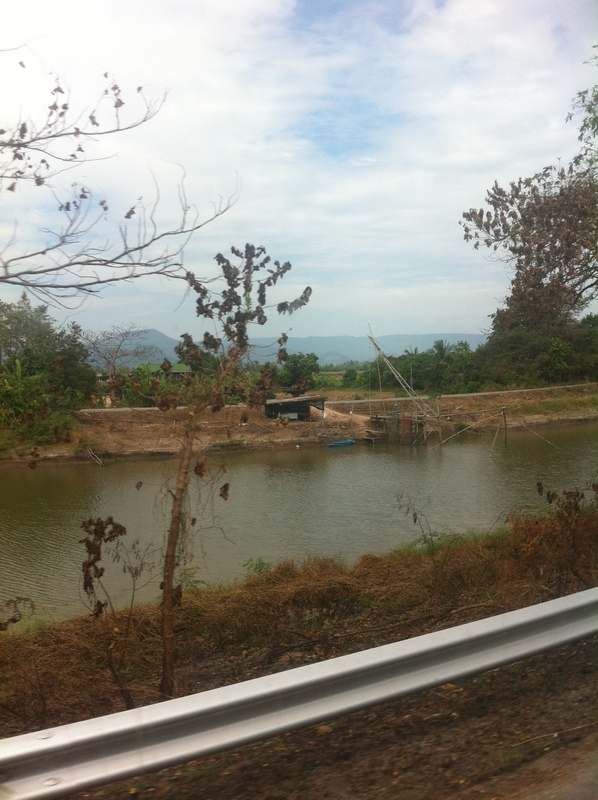 I was sent to meet you here and take you through the Cambodian side to the car!” I’m relieved. Most of the signs were not in English and I would have had some difficulty finding the other border office without this guy’s help. I make it through and find the car (the driver had sent this guy to find me and help me get to him), in which myself and another volunteer–who was there to renew her visa–head to Battambang. After that all-day fiasco, I had planned on sleeping in the car. But driving in Cambodia is absolutely insane. There are tons of scooters and motorbikes on the roads at all times, and the car would get so close to them that if I wanted to, I could roll down the window, reach out, and squeeze someone’s brakes if I wanted to. Almost everyone drives recklessly. For example: passing on the narrow roads with just a few meters to spare from getting in a head on collision. We almost died a few times. It is safe to say that I got no sleep in the car. We finally arrive at the volunteer house at 8pm, just 16 hours after I began the journey that morning. But I have finally arrived to my home for the next month. This entry was posted in Cambodia, Travel, Uncategorized and tagged Border, Bus, Cambodia, Journey, Thailand, Travel on March 17, 2013 by hanlont.